This is Zach Castine, who received a bone marrow transplant at age 3 for Wiscott-Aldrich Syndrome. And then, over a decade later, Zach devoted 3-4 hours a week over a summer to assisting His Grace Foundation with a number of volunteer activities like welcome basket making for newly admitted patients and general office tasks. 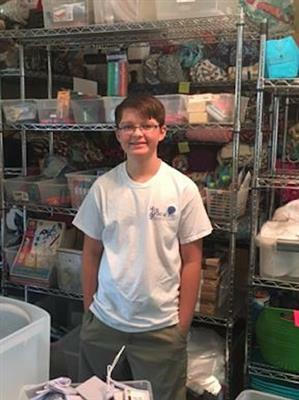 When asked why he wanted to volunteer, Zach said, "You helped me and now I want to help you." Thank you for all of your help, Zach! We give thanks for your life and your continued connection to HGF.